The Replace dialog box allows you to search your text or a portion of your text for a particular word, phrase, punctuation, or other text element and substitute a different word, phrase, punctuation, or text element. The Replace function can be a powerful and time-saving editing tool. However it is easy to make mistakes using it. Become acquainted with the Undo command before going too far with it. 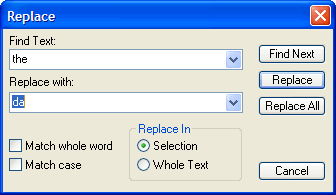 To open the Replace dialog box, select Edit>Replace from the Text Editor dialog box menu bar. Or, press the CTRL+H keyboard shortcut. Make global changes to certain text or text elements using the Replace dialog box. Find Text Enter the text or text element you want to find. Replace with Enter the text or text element you want to substitute for the text specified in the Find Text field. Match whole word Click to checkmark to find only whole words specified in the Find Text field. Match case Click to checkmark to find only text with uppercase and lowercase characters as specified in the Find What field. Replace In Click the radio button corresponding to the desired search and replace parameters. Click Selection to search and replace only in a block of text highlighted in the Text Editor. Click Whole Text to search and replace in the entire contents of the Text Editor. Find Next Click to find the next instance of the text specified in the Find Text field. Replace Click to substitute the current instance of the text specified in the Find Text field with the contents of the Replace with field. Replace All Click to substitute all instances of the text specified in the Find Text field with the contents of the Replace with field. Cancel Click to cancel the operation and close the dialog box.